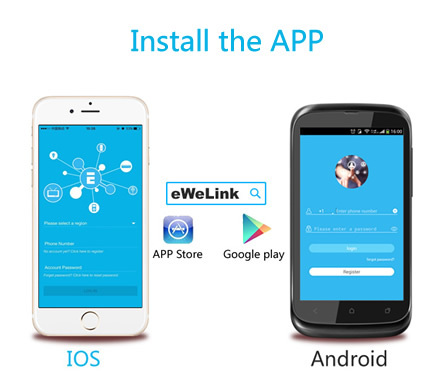 Search “eWeLink” in APP Store for iPhone or Google play for Android. 2. Screw Slampher with E27 light bulb. 1. Power up the device after you complete the installation. Press the pairing button once to turn off the lamp first. 2. Press the button for 7 seconds until the green LED fast blinks. Due to this model has used different firmware and module, the led has two blinking ways. 3. It will auto-search and connect the smart home device around you. 6. Maybe the device is “Offline” on eWeLink, for the device needs 1 minute to connect with your router and server. When the green LED on, the device is “Online”, if eWeLink shows still “Offline”, please close eWeLink and re-open. Fast press the pairing button on Slampher twice, the red LED blinks once, then press one of the buttons of your RF controller to set pairing for 1-2 second. Note: One Slampher can be learned with only one button of the 433MHz RF Remote. Press and hold the pairing button on Slampher for 3s, you see the red led blinks once. Press a button on RF Remote, and it will be learned successfully. Note: One Slampher can learn with 14 RF Remote buttons. The 15th RF button will cover the first button that has been learned. Fast press the pairing button on Slampher for three times, the red LED is on for 3s, that means the RF controller code has been cleaned. If you failed to pair, please try to clean first. Press and hold pairing button on Slampher for 5s, you see the red led blinks twice. Press the button on the RF Remote, the code will be cleared. Answers: the Slampher supports to be controlled by LAN(Update in 15/10/2017, LAN function has been stopped). 4. The green led keeps off, even if the device is powered on. Press the button but the device does not work. Answers: The circuit may be broken, please send it back for testing. Return shipping postage and packaging will be at buyer’s expense, if the device is damaged by the buyer, and the buyer should bear extra repair cost.